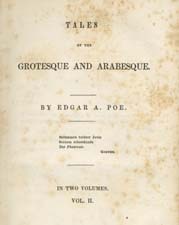 Edgar Allan Poe, 1809-1849 Tales of the Grotesque and Arabesque. In Two Volumes. Vol. II. Tales of the Grotesque and Arabesque. In Two Volumes. Vol. II. Philadelphia: Lea and Blanchard, 1840.